Juried art show and fundraiser for the Saratoga Springs Preservation Foundation held on Oct. 5. The past, present and future were on display at the 2017 Trask Art Show & Sale at Canfield Casino in Congress Park. The juried art show and fundraiser for the Saratoga Springs Preservation Foundation on Oct. 5 was held during the apex of our remarkably balmy Indian Summer. Women in sleeveless dresses, men in shorts, children playing ball and feeding the ducks (despite the signs) filled the city’s 17-acre backyard. Famed landscape artist Frederick Law Olmstead helped create the basin-shaped park, with its mineral springs, Grecian pavilions and stunning Spirit of Life fountain—a memorial to Spencer Trask added in 1915 and restored by the SSPF a century later. The park is at its best when the swelter of summer passes and autumn’s amber leaves peep out. And that’s why everyone was here. The Trask Art Show benefits ongoing efforts to maintain and restore the beauty of the town and share its story and treasures for years to come. Artists were invited to submit works that interpreted the spirit of life in Saratoga Springs by directly addressing local history, architecture, culture, preservation and concepts of philanthropy. The judges were Saratoga Arts founder Delores “Dee” Sarno and contemporary landscape artist Takeyce Walter. 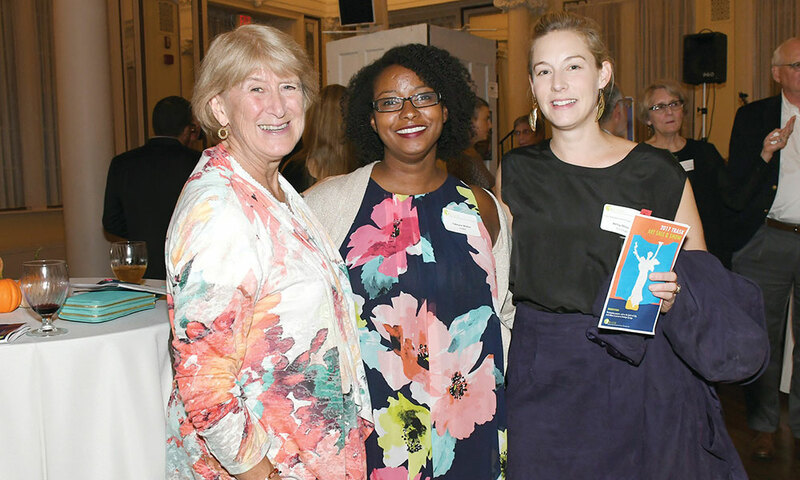 A printmaker, Betsy Olmsted (her work has been featured in HGTV Magazine, House Beautiful and Saratoga Living), and photographer Elizabeth Pedinotti Haynes (whose work has appeared in this magazine and many others) co-chaired the evening. As the band Tanager played, the open bar flowed and delicious appetizers were passed, attendees took in the paintings, photographs, prints, drawings and mixed-media sculptures. Ballerinas, horses and stunning landscapes dominated. 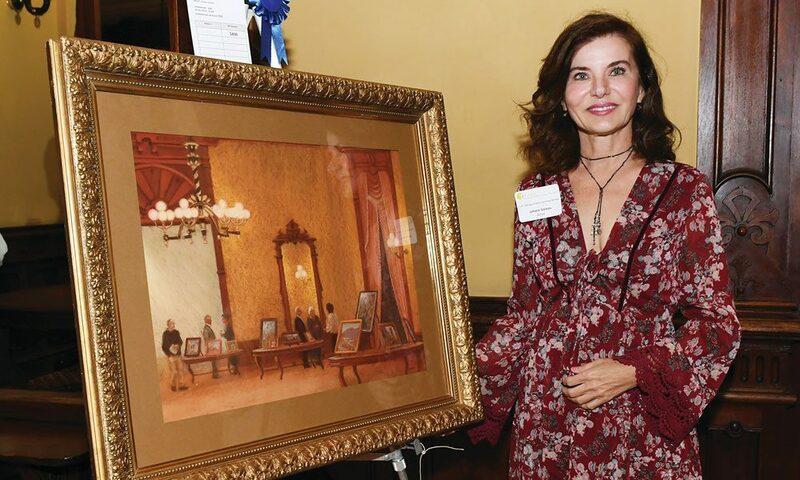 One of the more memorable items included Jerolyn Ouimet’s “At the Canfield Casino,” which recreated the very room it was displayed in, with soft pastels. The effect was shimmering and Klimt-like, and throughout the night, attendees were drawn to its quiet but gilded beauty. 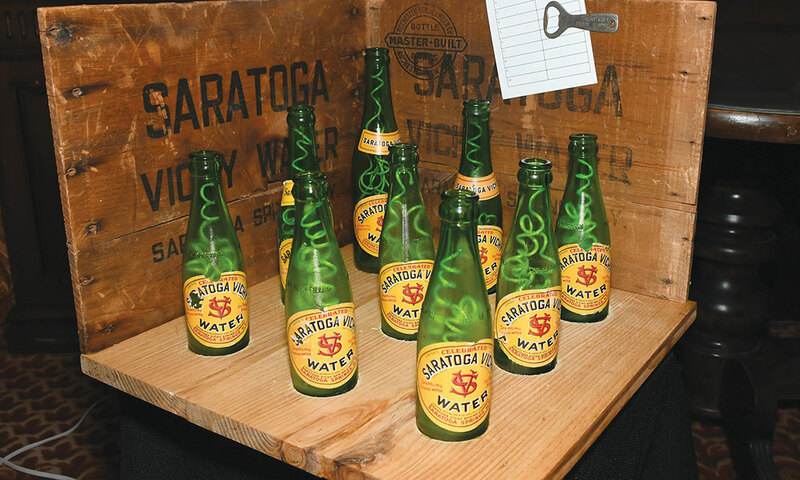 One eye-magnet — equal parts delightful, fun and intellectually stimulating — was Chuck Miller’s “Spirit of Saratoga,” a sculpture featuring old bottles of Saratoga Vichy Water (he got them on eBay) and a wooden Vichy crate circa 1960 (from a local antique store), all of it wired with a flashing light display. Was it subtle? Would I want it in my living room? No, but I wouldn’t want Marcel Duchamp’s “Fountain” (1917) there either. And like Duchamp and his conceptual art, the piece evokes the subject (in his case, the spirit of Saratoga) literally and metaphorically and is just good, smart fun. In addition to many of the artists, the judges and organizers of the event, most of SSPF’s board, Assemblywoman Carrie Woerner, Mayor Joanne Yepsen, Supervisor Matt Veitch (who also came wearing his SSPF board president hat), Supervisor Peter Martin and Commissioner of Public Works Skip Scirocco attended to support Saratoga’s past, present and future. The evening was a closed loop in the best way: it paid homage to the past while funding the future of the storybook town we’ve been lucky to find ourselves in and must preserve for future generations.